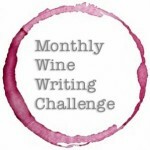 This is the sixth installment of the Monthly Wine Writing Challenge, but the first one I have been able to enter. The theme of “Mystery” was set by The Drunken Cyclist who won the previous month’s challenge. Normally I read the other entries which are posted to get an idea, but on a couple of occasions I’ve seen other people have already had a great idea which was at the back of my mind – and plagiarism isn’t good, even the appearance of it. The door was unlocked so I let myself into the hallway; the rain was coming down like bullets into the night so I needed to get out of the rain. I peeked round the corner – nobody there, so I headed down the stairs and took a seat at the bar. “How are you Frank? What’ll you have?” said the bartender. He was new. His accent was strange..somewhere from the mid-Atlantic. His pale skin and red hair made him look like he would get sunburn from a lightbulb. He must have heard my name from the boss. “No. A bottle” He obviously didn’t know me. Not. At. All. The bartender opened the bottle with a brief sigh (the bottle, not him) and poured me a glass. He put the bottle in an ice bucket with a fancy towel over top. It said “Ely” on the towel. I knocked back a mouthful – man, this was great stuff. Creamy, complex, red fruits and biscuit with a long finish. My kind of drink. In fact, it was my regular drink at Ely. Don’t get me wrong, I like some of the other fizzy stuff they had, but not the Italian or Spanish garbage – far too simple, far too easy. I quaffed the rest of the glass then poured myself another. The bar owner walked in and nodded to me as he walked past. “On the usual, I see, Frank”. Obervant as usual. He was a nice guy, real friendly, but left me alone when I wanted to be. “Great, I’m sure you will like some of them, Frank!” He seemed excited, like a puppy. This had better be quick and had better get him off my case. He took a bottle out of the fridge behind the bar and popped the cork. Reaching up, he grabbed a couple of glasses from the shelf above the bar. I didn’t like Prosecco. I hated it. In fact, I hated it with a loathing far beyond mere contempt. It was a chick’s drink. As Fred poured us both a glass, I looked round to make sure no-one else could see I was trying such an absurd drink. Bam! Fruit all the way! But then it was gone, as quickly as it came, leaving a slight prick of acid in my throat. It was like using a water pistol instead of a real gun – surprise from the impact, but no lasting effect. “Coming right up, my friend.” He fished another bottle out of the fridge. This time it looked to have a regular Champagne cork. Another pair of glasses. He poured again. At least this seemed to be properly fizzy. “So you reckon this is better, huh? Where’s it from?” I asked. I took a mouthful. Nice and round in the mouth. Not sweet. Biscuitty. Chewy even. But then it faded quickly; far too simple. The label said Freixenet Elyssia. Sounded more like a medical complaint than a drink. It might seems strange, but I’m posting my 2014 Wine Resolutions before my 2013 Best Wines, mainly because it will be shorter. Yes, that’s right, Muscadet – the classic example of a bone-dry white wine. It’s supposed to be perfect with white fish and sea food, but as I don’t eat that much sea food at home I’ve nearly always tried it on its own. The Melon de Bourgogne grape doesn’t have that much flavour, so some of the better growers let it mature on its lees (dead yeast cells and other solid matter) to give it a bit more oomph. And that helps (a bit). And how does it taste? Well, frankly, many of the bottles I’ve had over the years have been somewhere between vinegar and paintstripper. It’s usually very high in acidity with no residual sugar (RS) and the lack of flavour can make it taste thin and just, well, unpleasant. Most people with a bit of wine knowledge realise that Cava’s image is quite poor in the UK (where I’m from) and Ireland (where I live). It’s made in the traditional method like Champagne, but although the Chamapgne grapes Pinot Noir and Chardonnay are permitted nowadays, Cava is often made from the indigenous grapes Macebeo, Parellada and Xarel-lo. Perhaps I’m being a snob here, but these grapes don’t sound that promising as base material for great sparkling wine. Whenever I’ve put a Cava into a flight of sparklers in a blind tasting it has been spotted by most of the tasters, usually because of its relative lack of refinement and a certain earthiness. Cava is often one of the cheapest sparkling wines in the supermarket which sounds a bit crazy when you consider the production method, more costly than Prosecco’s tank method, for example. So how do they make it so cheaply? Firstly, grape yields are higher than Champagne (which are already high for a quality wine), so the same vineyard area produces more grapes. Secondly, many producers buy in grapes from growers, and the market price for grapes in Catalonia (where ~95% of Cava is made) is much lower than in Champagne. Thirdly, the miniumum length of the second fermentation in bottle is only nine months for non-vintage compared to fifteen in Champagne. Use of Gyropalettes (machines which enable riddling to be done in bulk in a much shorter period) is another significant cost saving and is now standard for Cava. Of course, some Champagne houses do use them as well. Finally, due to its place in the market there is far far less spent on marketing and publicity for Cava compared to Champagne. I will also be scouring the Cava section of the Christie’s World Encyclopedia of Champagne & sparkling wine which I was lucky enough to be bought for Christmas. If you like fizz, buy this book! This is Italy’s quality traditional method sparkling wine made in Lombardy. I must confess I haven’t tasted a single sip to date! Franciacorta gets some good press, but as the volume of production is relatively low (about a tenth of Champagne) and domestic demand is high, very little is exported. So there are my 2014 Wine Resolutions – what are yours?